Last June, I was invited to the first Happiness Boot Camp for bloggers which was sponsored by Cebuana Lhuiller Insurance Solutions. It was an overnight event at the Nature Spa Village, Tagaytay and I was lucky that it was scheduled a few days before my birthday so the boys allowed me to participate in the boot camp and for that I am so thankful. I'm generally a happy person. Growing up deprived of most of the luxuries in this world prepared me to be optimistic and content with what I have now. But the Happiness Boot Camp lifted my spirits higher. It taught me how to find happiness from within. 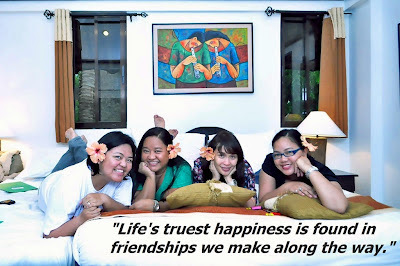 Most of all, it gave me a night of fun, friendship, and bonding with fellow bloggers Iris Acosta, Jennie Aspacio, and Iris Pulga. We called ourselves "Grasyas" because our room's name at The Nature Spa was Grasya. The kulitan and chikahan still continues up to now on BBM, hahaha! Me and my pretty roommates, Iris of PinayAds, Jennie of Marriage and Beyond, and Iris of Entrepremom. Unhappy thoughts trigger unhappy emotions. Angry thoughts trigger anger. The more you keep that unhappy and angry thoughts inside you, the more stressful you become. Believe me, stress leads to a lot of health problems. It's all in the mind. Choose only positive thoughts and throw away all those unhappy and angry thoughts from your brain. Practice being in the "eye of the storm." During a storm, the most peaceful part is in the middle or in "the eye." Take a moment of silence even when unhappy thoughts are storming your being. That moment of silence will help you to transform those negative traits, obtain self-control, improve your vision of your self, and replace the spiritual energy you spent in thinking about your problems. Initiate random acts of kindness. Don't you feel happy after helping someone no matter how big or small it is? But random acts of kindness are selfless and they don't ask for anything in return. By doing an act of random kindness, you are not only making yourself happy but you are also spreading positive energy to others. Maintain an attitude of gratitude. Begin and end each day by taking time to say "thank you" for all the things you have to be grateful for. Even the small things count. Just the same, be also thankful for the things that you are not to happy about. I am even grateful for the tons of wordpress hosting reviews I need to read even when I'm not too fond of it. At least, I have a job and for that I am uber thankful. Accept and let go of the past with grace and understanding. The unhappy thoughts you have of your past will only drag you away from true happiness. Laugh at your own mistakes because they have made you the wiser person you are now. Learn to forgive those who have hurt you because it is only through forgiveness that you display your strength.